A few years ago, when the bouldering park was just a vision, most of what you could see of the boulders was the kudzu and other invasive plants that covered them. Sometimes we had no clue a massive boulder even existed under the curtain of vines. At the beginning of the vision for the Pollinator Garden, there were invasive Privet standing 10-15 feet high covered by Kudzu, a sight that could easily be described as overwhelming to know that the goal would be to enter that forest to change it back to the native species. Fast forward a few summers and a few thousand volunteers later, and you’d be amazed to see the difference. When people come together with a purpose, it is incredible what can be accomplished. Working on one little area, in one day, it can be hard for someone to envision the change that they are helping to create, but every little bit helps. We are continuously blow away by the effort and attitudes that people bring to the mountain to help give it a better future and a place for others to enjoy. 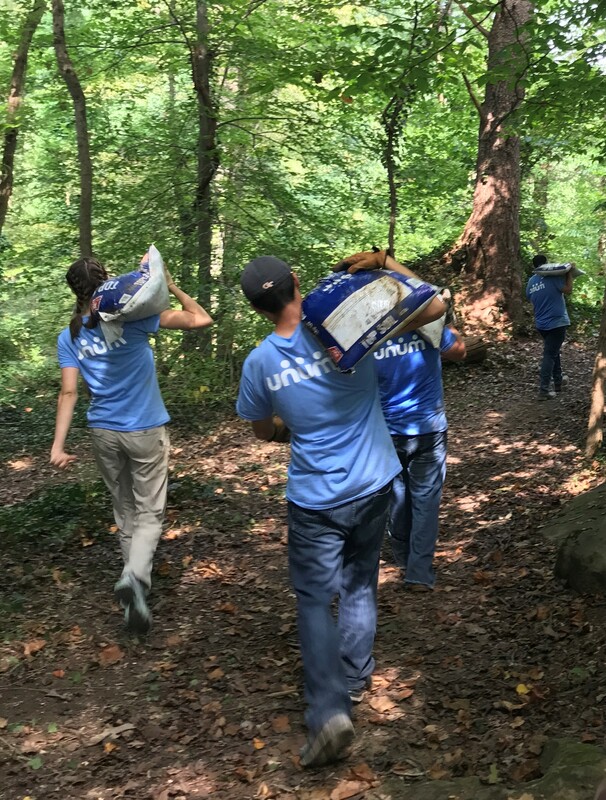 Friday September 21, Unum packed the Mountain with 200+ employees for their annual Day of Caring. we walked around the property with the Interns again in awe of what the people from Unum helped accomplish in a few hours. 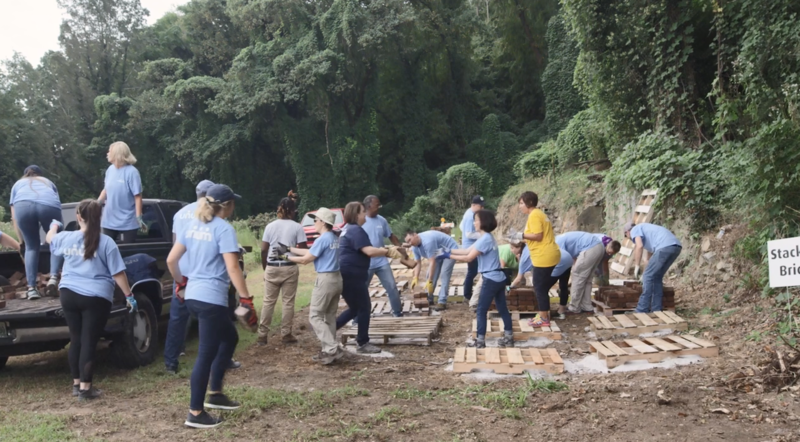 With opportunities to work on the bouldering park, pollinator garden, and move some historic brick on the property, they came ready and willing to put in a hard day’s work. A few of the Interns made comments about how it was neat to hear people meeting each other for the first time because they worked in different departments at Unum. 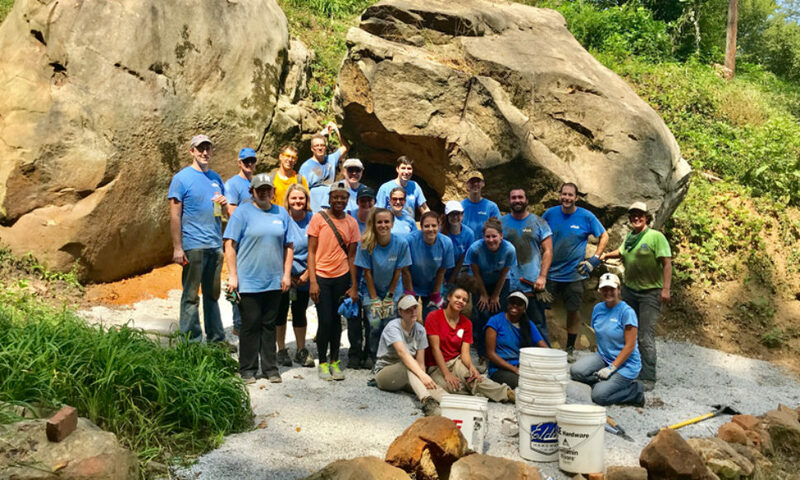 Not only did they meet their co-workers, but they also worked on 14 boulders, finishing some landing pads and building new ones and stairs, to get ready for climbers this fall. They also tirelessly combatted Kudzu, Privet, and other invasives in the pollinator garden to make way for the native plants to resurface this spring. One of the coolest parts about the Park are the historic bits scattered all throughout. An old wall and path were cleared to connect some of the Boulders, and the historic brick was moved to preserve it. 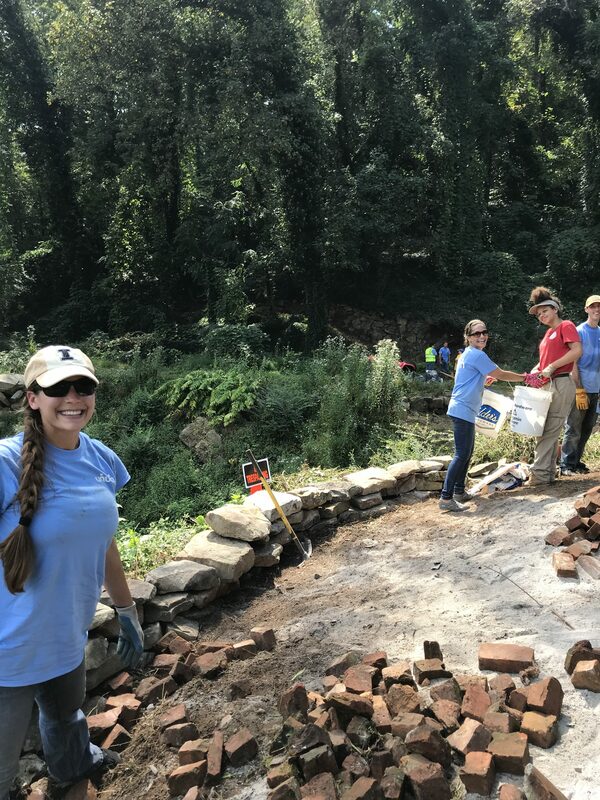 Every person that comes to volunteer at the Park helps build upon the restoration efforts of others that have come before, and those that will come next to help continue the work. We are grateful for our community and for the change our neighbors are bringing to the Mountain.